Who invented the Helicopter? The name of the person credited with inventing the Helicopter is Igor Sikorsky (1889 - 1972). Igor Sikorsky is not only famous as the Russian-American inventor of the Helicopter but also as a designer and aeronautics engineer. When was the Helicopter invented? Igor Sikorsky invented the Helicopter in 1939, during the WW2 (1939 - 1945) period of invention. The invention of the Helicopter originated in America and is considered a leading achievement in the field of Transportation and Technology. Definition of the Helicopter: The Helicopter is defined as a type of aircraft without wings that derives its propulsion and lift from overhead blades that rotate providing the vehicle with the capability of hovering, vertical flight, and horizontal flight in any direction. Fact 1: Who invented the Helicopter? The Helicopter was invented by Igor Sikorsky in 1939 during the WW2 (1939 - 1945) era of inventions. Fact 2: Who invented the Helicopter? Prior to the invention of the Helicopter in 1939, Wilbur and Orville Wright had designed the first powered, controlled flight of an airplane. Fact 3: Who invented the Helicopter? Airplanes need lift, thrust, force and drag in order to lift off and fly. The helicopter is different because it generates lift simply by spinning its rotors very rapidly. A helicopter does not need to be moving in order to generate lift, so it does not require a runway to take off or to land. Fact 4: Who invented the Helicopter? Men had envisaged such a vehicle for thousands of years. The Chinese had invented kites as toys for their children to play with and by 400BC had also created flying toys called spinning bamboo propellers, that have since been given the name 'bamboo-copter' because of their similarity to the revolving blades of a helicopter. Fact 5: Who invented the Helicopter? The period of Renaissance Inventions saw Leonardo da Vinci (1452-1519) began making plans and producing sketches for flying machines that included a helicopter, that he called the Aerial Screw. The idea of the screw-like machine was to compress air to obtain flight, similar to today’s helicopters. Leonardo da Vinci said that "the screw will make its spiral in the air and it will rise high". Leonardo da Vinci never actually built the Aerial Screw but his drawings and notes provided details of exactly how such a machine would operate. Fact 6: Who invented the Helicopter? In 1754 Russian scientist Mikhail Lomonosov (1711-1765) developed a working model of a a flying apparatus that could take off vertically with two propellers. Fact 7: Who invented the Helicopter? In 1843 Sir George Cayley attempted to create a rudimentary engine fueled with gunpowder to propel a heavier-than-air vehicle. He designed an "Aerial Carriage" using four umbrella-like propellers that would rotate for lift. Sir George Cayley's "Aerial Carriage" never successfully hovered or flew. Fact 8: Who invented the Helicopter? In 1861 Gustave Ponton d'Amécourt (1825 - 1888), designed and patented a model flying machine using coaxial propellers and a coiled spring for propulsion. The word "helicopter" was invented by Gustave de Ponton d'Amécourt, taken from the Greek 'helikos' meaning "Spiral" and 'pteron' meaning "wing". Fact 9: Who invented the Helicopter? In 1886 the famous French author Jules Verne, inspired by Ponton d'Amécourt, depicted the Albatross Flying Ship in his novel 'Robur, the Conqueror'. The flying ship that featured in the book was named the Albatross which was able to fly through the air by using 37 helicopter-like propellers. Fact 10: Who invented the Helicopter? In the 1890's the German engineer Otto Lilienthal (1848 - 1896) pioneered gliders and in 1900 the Zeppelin Airship was invented by Count Ferdinand von Zeppelin (1838 - 1917). But it was the famous brothers Wilbur Wright (1867 - 1912) and Orville Wright (1871 - 1948) that achieved the first powered, sustained and controlled flight of an airplane in 1903. Fact 11: Who invented the Helicopter? Another great inventor Robert Hutchings Goddard (1882 - 1945) even invented the Rocket in 1926, thirteen years before the invention of the modern helicopter in 1939. Fact 12: Who invented the Helicopter? The inventor of the Helicopter, Igor Sikorsky, was born on May 25, 1889 in Kiev, a city in the Russian Empire (now Ukraine) and died on October 26, 1972. Fact 13: Who invented the Helicopter? The early years of Igor Sikorsky were spent in Kiev, Russian Empire (now Ukraine) where he was raised by his family in which he was the youngest of five children. His wealthy father, Ivan Alexeevich Sikorsky, was a member of the nobility and a professor of psychology and his mother, Mariya Sikorsky was a physician. Fact 14: Who invented the Helicopter? 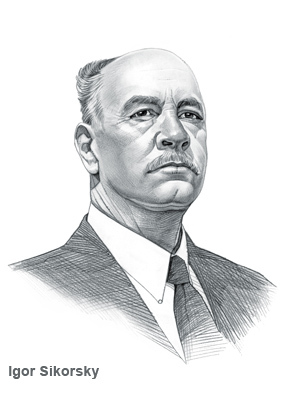 Igor Sikorsky was educated at Kiev Polytechnic Institute and as a young man he learned how to fly and the first plane in the world to have four engines. The four engine airplane was built in St. Petersburg, and Igor Sikorsky entertained passengers from the courts of the Russian Czar Nicholas II and the elite of Russian society by shutting down two engines on one wing and continuing the flight with just two engines running. Fact 15: Who invented the Helicopter? WW1 (1914 - 1918) erupted and Igor Sikorsky was forced to flee for his life from the horrors of the Bolshevik Revolution in 1917 and fled to the United States where he started an aviation company. The famous Russian composer Sergey Rakhmaninov invested a huge sum of money into the Sikorsky Aircraft Corporation and became its vice-president attracting valuable publicity. Fact 16: Who invented the Helicopter? In 1924 Igor Sikorsky married Elisabeth Semion and the couple went on to have four sons. In 1928, Igor Sikorsky became a naturalized citizen of the United States of America. Fact 17: Who invented the Helicopter? In 1928 Sikorsky Aircraft Corporation produced the Sikorsky S-38 an amphibious flying boat which was purchased by Pan American Airways and the U.S. Army. In 1929 the Sikorsky Aircraft company became a part of United Aircraft and Vought Aircraft Company. The Sikorsky S-42, called "Flying Clipper", was developed in 1934 as another successful commercial flying boat. Fact 18: Who invented the Helicopter? Igor Sikorsky spent all of his spare time working on designs for a helicopter. As a child he had read the Jules Verne novel about the Albatross Flying Ship and it had become a lifelong obsession to create a helicopter that could really fly. Fact 19: Who invented the Helicopter? In 1938, when Igor was working as the Engineering Manager of the Vought-Sikorsky Division of United Aircraft, he succeeded in convincing the directors that his research into rotary-wing flight was at the point where he could build a helicopter. Fact 20: Who invented the Helicopter? His first experimental helicopter, the VS-300, introduced a single engine to power both the main and tail rotor systems. The was VS-300 test flown by Igor Sikorsky on 14 September 1939, tethered by cables. Fact 21: Who invented the Helicopter? The VS-300 helicopter went on to make its first untethered flight in May 1940 and by July 18, 1940, the VS-300 was able to stay in the air for 15 minutes. On May 6, 1941 Igor Sikorsky established a world helicopter endurance record of 1 hour, 32 minutes, 26 seconds. Fact 22: Who invented the Helicopter? The VS-300 helicopter was soon followed by the Sikorsky R-4, known as the Hoverfly. The R-4 was a two-seat helicopter with a three-bladed main rotor, made its first flight on 14 January 1942 and became the world's first large-scale mass-produced helicopter. The Sikorsky R-4, or Hoverfly, was utilized by the Allied Forces during the latter part of WW2 (1939 - 1945). Fact 23: Who invented the Helicopter? Igor Sikorsky died on October 26, 1972 at his home in Easton, Connecticut and is buried in Saint John the Baptist Russian Orthodox Cemetery. He will always be remembered as the inventor of the helicopter. Who Invented the Helicopter? - Igor Sikorsky - Inventor - Helicopter Invention - Definition - Meaning - Famous - Important - Helicopter History - Helicopter Timeline - Innovation - Significant - Development - Transportation - First - Definition - Kids - Facts - Information - Info - Who invented the Helicopter - Dates - When - Why - Impact - Purpose - Use - New - Old - Amazing - Best - Helicopter Definition - Meaning - Awesome - Cool - WW2 (1939 - 1945) - Russian-American - History - Timeline - Who invented the Helicopter?